The actress' tresses appeared to be in disarray as she walked thought the capital, after opting for a chic, summery look. The 25-year-old happily showed off her toned legs in the pale blue dress, which came complete with floaty skirt and thick straps. Emma gave her elegant number a masculine edge with a grey blazer, before polishing off her attire with chunky, grey heels. 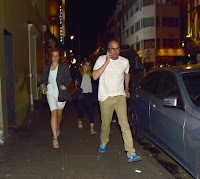 She appeared to be wearing very little make-up, and kept her phone close to hand during her outing.